Anchorage is going green. The administration of Mayor Ethan Berkowitz is moving forward on a new climate action plan, and simultaneously pursuing measures to reduce the city’s carbon emissions. The moves come at a time when cities and states across the country are clashing with federal environmental policies, and developing their own climate initiatives. But how much can a city like Anchorage actually do to curb carbon emissions? On a recent Friday morning, Rafael Contreras sat in the cab of his garbage truck, toggling a joystick with his left hand to carefully pinch and lift recycling bins with a massive hydraulic arm on the truck’s right flank. Originally from the Dominican Republic, 65-year-old Contreras came to Alaska after a career playing professional baseball. But for the last 13 years he’s driven garbage trucks for Solid Waste Services, the municipality’s trash collection utility. The job gives him a unique perspective on a an intimate side of the city. The city-run garbage and recycling programs use a lot of energy. Mostly in the form of fuel for the hulking 22-ton trucks that crawl up streets and alleys. Contreras’s trucks get, on average, just two-and-a-half miles to the gallon. It’s an inefficiency that, for Shaina Kilcoyne, creates an opportunity. As the Energy and Sustainability Manager for SWS, it is Kilcoyne’s job to find ways for municipal entities to save money and energy. “One of the things we’re doing is looking at ways we can electrify our fleet,” Kilcoyne explained. If you’re a city like Anchorage, there are only so many resources you control that relate to energy usage. 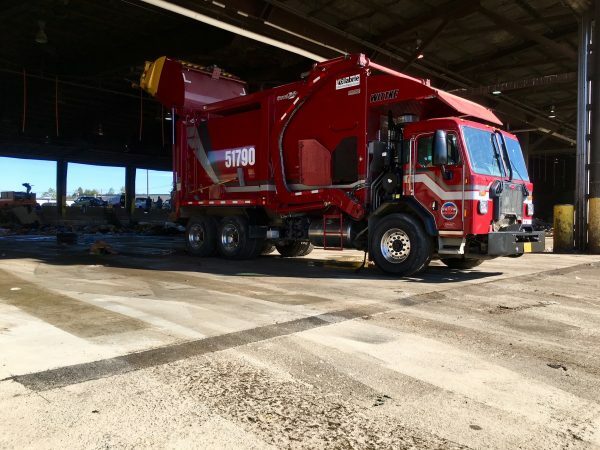 But a big one is the fleet of cars, trucks, buses, snowplows and lumbering red garbage trucks under local government control. There’s also road infrastructure more broadly — particularly since the sprawling municipality is such a car-centric city. “This is actually a big priority because over 50 percent of our emissions are coming from transportation in the city of Anchorage,” Kilcoyne said. Much of her work involves turning energy-related measures from policy proposals into practice. That means developing big picture ideas on topics like city planning, food systems, as well as renewable energy, and then finding practical ways to implement them. This isn’t always flashy or forefront of residents’ attention. A pilot program this winter is experimenting with electric trash trucks to see how they perform in the cold climate. The city is already testing eerily quiet electric buses. And so far, Anchorage has upgraded around 4,000 streetlamps, changing the old High Pressure Sodium lights to efficient new LEDs. But those 4,000 replaced represents only one tenth of all the streetlights in town, managed by a patchwork of different public and private entities. Still, Kilcoyne and the administration argue this is not just about environmental protection, it’s good long-term fiscal policy. More efficient lights mean less energy is used, and in the longer term less spending on employee labor to replace them. But there’s only so much a local government can control. The municipality is far from the largest energy customer in Anchorage. According to a public report last year, just four percent of the city’s total energy load is attributable to the municipality. Five percent if you include all the streetlights. And the clock is ticking. The climate is changing so rapidly that Kevin Kennedy, a senior fellow at the World Resource Institute, insists things are too dire to be selective when it comes to which policy measures are worthy of pursuit. “Everyone needs to step up and do what they can,” Kennedy said. Kennedy researches how states, the federal government and businesses can all address carbon emissions. Each unit, whether it’s a city, a region, or an office building, has assets it uniquely controls. Cities, for example, can enforce greener building standards, waste management, and public transit systems. Typically it is states or regions that have the ability to shift away from carbon-based energy sources. When Kennedy worked for the State of California people would pessimistically point out that even if the whole state went to zero emissions overnight, globally that would only amount to a one or two percent reduction of what humans are pumping into the atmosphere. In Kennedy’s assessment, even if the Municipality of Anchorage can only affect four or five percent of the city’s total energy usage, a sliver of the global carbon load, the move is meaningful.